Many towns have a house that’s instantly recognizable to people living in the surrounding area. 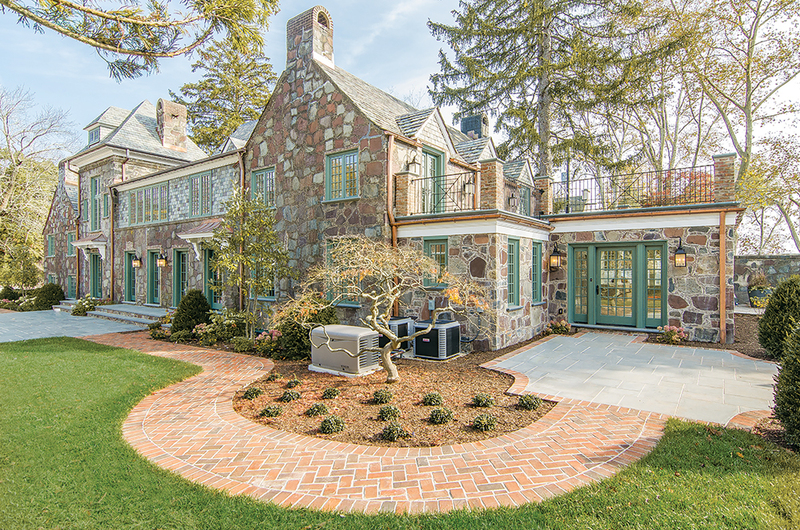 In Princeton, New Jersey, it’s this 1925 fieldstone residence. 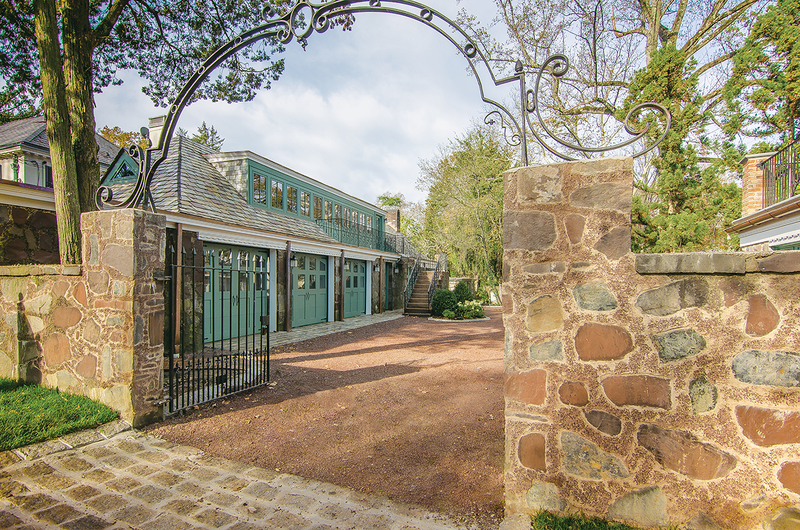 “The house is noticeable and notable,” says Jay Grant, president of Mendham, NJ-based Grant Homes and owner of this residence. 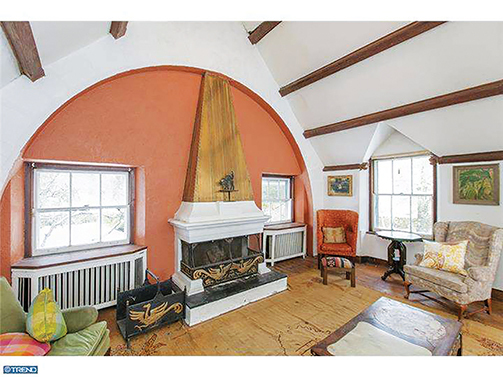 Designed by architect Ernest Flagg, the home was first owned by Walter W. Colpitts, a civil engineer, Grant notes. “As an engineer, he may have been impressed by Flagg’s structural approaches.” Over the years, the home changed hands several times until Grant purchased it several years ago. 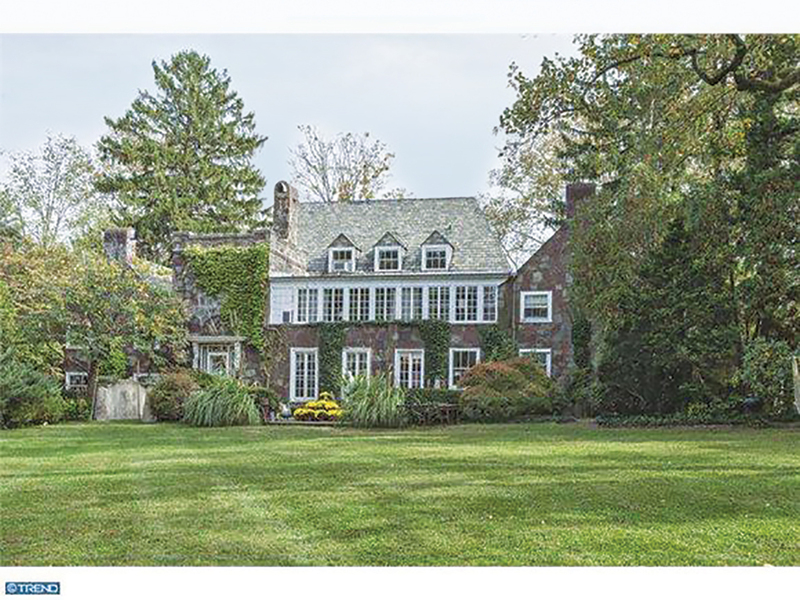 (It was once owned by descendants of J. Seward Johnson, a renowned sculptor and grandson of Robert Wood Johnson, cofounder of New Brunswick, New Jersey-based Johnson & Johnson. Seward Johnson’s home is also featured in this issue). 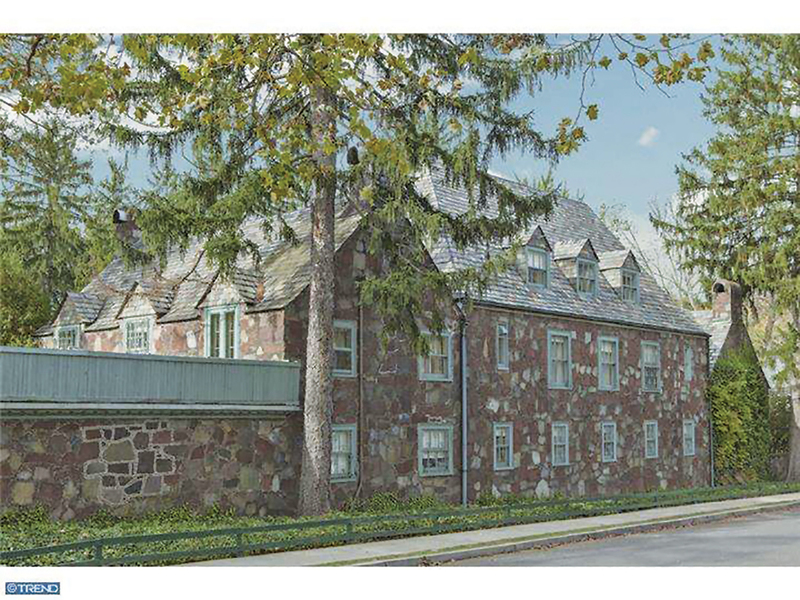 Design NJ: What is the architectural style of this home? Jay Grant: It is most similar to a Normandy Manor style, but it has many of its own unique architectural details, including the roofline and the stone detail. The architect, Ernest Flagg, was quite famous in the early 20th century. He designed the Singer Building in Manhattan, which, at 47 stories, was the tallest building in the world at the time it was constructed. DNJ: What kind of shape was the house in when you acquired it? JG: It had been virtually untouched for 100 years. It had no air conditioning. It had no insulation. The windows were still single pane. ARCHITECTURAL DRAWINGS | The original architectural drawings were discovered in a tunnel during the demolition phase in the main house. The tunnel was used to service mechanical systems at the time the home was built. New. The new drawings reimagined how the spaces would be used. In addition, guests originally entered the property through a gate on the left side of the home, walked around to the rear patio and then entered through the door in the back. There was never a true front door on Cleveland Lane [the street on which the house is situated]. People would drive by without understanding what they were looking at. We added a custom mahogany front door on the street side of the house. Now there are uninterrupted sight lines from the front door to the backyard when standing inside the home. Many people have commented and complimented the fact that we changed the look of the house from the street but kept its core appearance. Instead of thumbing its nose to the neighborhood, the house now looks like it’s smiling at the neighborhood. DNJ: What did the renovation entail? JG: We gutted the house right down to the point of removing all interior walls and many of the floors. It’s interesting that the structure is primarily bearing on concrete walls. A structural engineer had to be consulted before we opened up the concrete walls due to the heavy slate roof sitting on them. We then hired a contractor to “lift” the home. The company used wood beam boxes to temporarily support the house while we cut through the 13-inch stone wall to expand the window sizes and install steel plates and girders to maintain the structural integrity. Grant created a sunroom from a first-floor space originally used as a vault. He added a master bedroom terrace above. Construction involved a steel structure, a concrete slab and a drain for rainwater. Before: Overgrown plantings at the back of the home were removed for a cleaner look. Before: Originally, the street side of the house had no “front door.” Visitors walked around to a courtyard with an entry door in the back. DNJ: How did you alter the interiors to be more compatible with a modern lifestyle? JG: Across the entire front of the house, small rooms served as servants’ quarters, sewing rooms or hobby rooms. We removed these rooms by taking down the concrete wall between the front and back of the house to create a magnificent 20-by-15-foot dining room and a 25-by-18-foot great room. 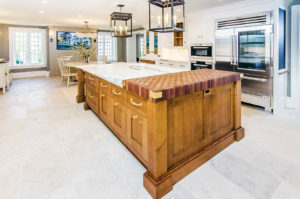 We reconfigured most of the interior walls and opened the floor plan to create spacious, luxurious living spaces, including a front-to-back Christopher Peacock kitchen. On the second floor, we opened up the walls to make all the bedrooms into suites with private bathrooms and walk-in closets. We also relocated a secondary staircase to enlarge the kitchen/ dining area. Additionally, we replaced a walk-in vault with a sunroom on the first floor and significantly enlarged the master bedroom terrace above the sunroom. The remainder of the house has the original footprint. 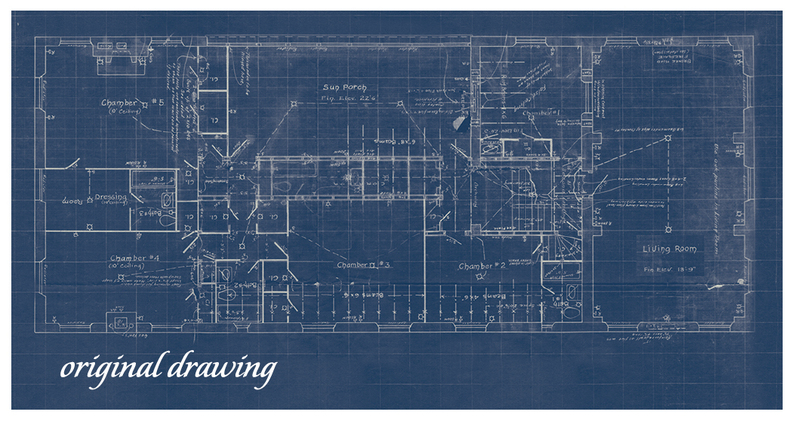 ARCHITECTURAL DRAWINGS, SECOND FLOOR | The original drawing shows the design was typical of luxury homes of the 1925-era. 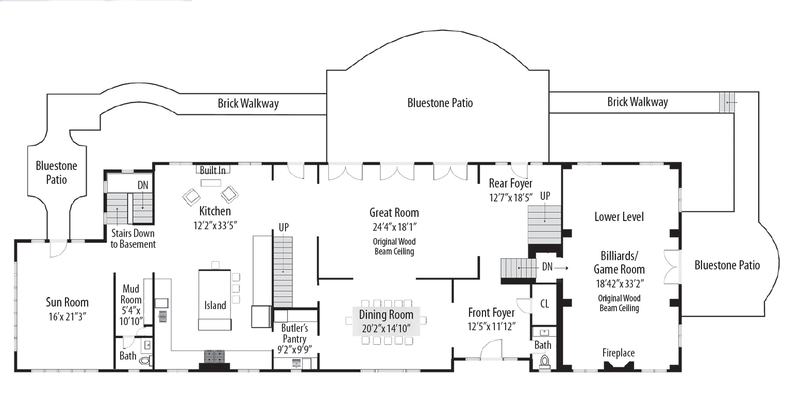 New: The second floor, like the first, was reimagined for modern living. DNJ: What challenges did the project present? JG: Building a bluestone terrace outside the second-floor master bedroom was a real challenge. We had to construct the equivalent of a parking garage because we needed a steel structure, a concrete slab and a drain for rainwater. We worked with a structural engineer and, though we built the structure last year, it looks like it’s been there for 100 years. The iron gate is original to the home. The number “75” on the original gate was moved to another gate on the property during the renovation. The garage off the courtyard was used as a carriage house when the home was built. The second floor now houses a guest apartment. DNJ: How did you ensure that the newer portions of the home match the original portions? JG: We worked closely with the structural engineer and the architect to be true to the vision. Matching the stone surrounding the new front door to the existing exterior was tricky because it required mastery of an unusual technique. The unique grout line of the original stone is impregnated with tiny pebbles and it has a distinctive color. It was trial and error; we had to combine different concretes with certain mixes to create multiple types of coloring. Eventually, our stonemason figured out how to duplicate the look and the technique to create not just a wide grout line, but a colored grout with pulverized stone wiped into it. If you look at the front door, some of the stonework is from just a year ago and it’s well matched to the 100-year-old stone. OFFICE?DEN | Grant added wood panels to the ceiling. 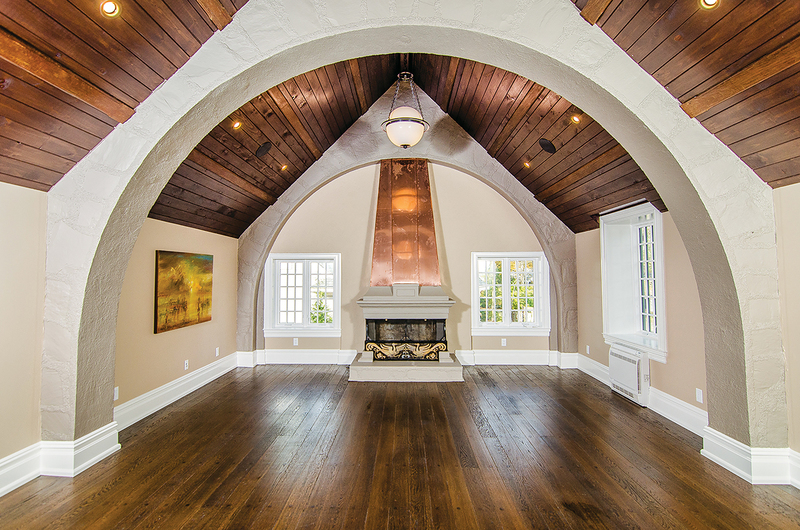 The wood beams (which project slightly from the newly added wood panels), the fireplace, fireplace cover, mantel and stone arches are original to the home. DNJ: Past and present seem to be combined seamlessly in this home. JG: It’s livable in the 21st century. 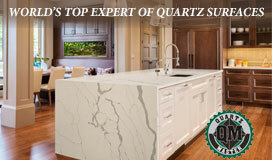 We’ve created a home that respects the past but honors the future. 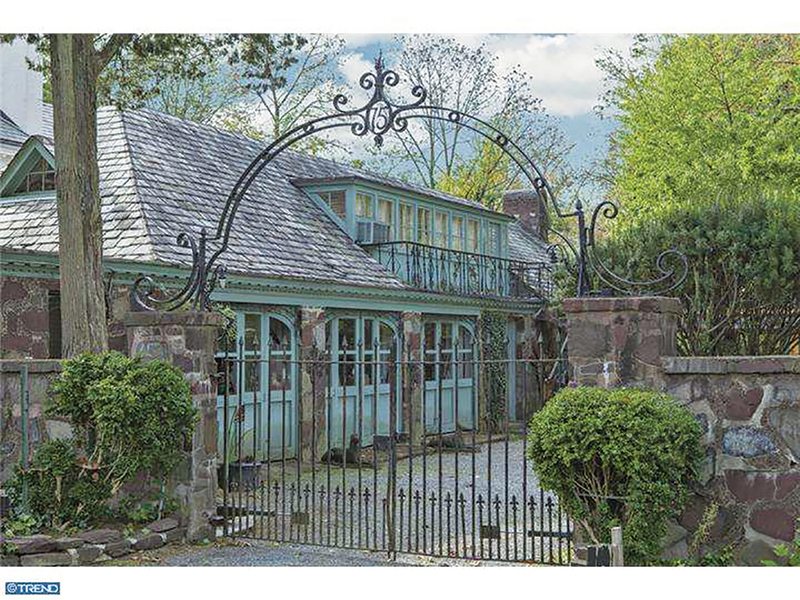 Overall: builder, Grant Homes in Mendham; architect, Peter Dorne Architects in Bay Head. 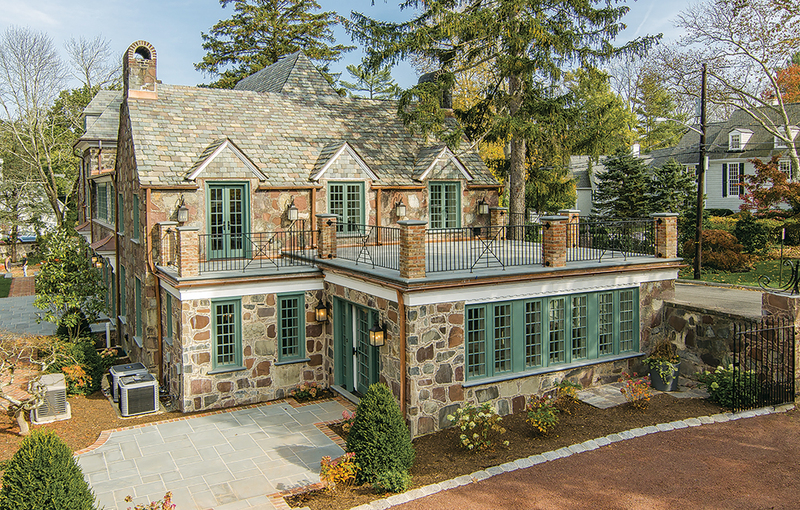 Exterior: landscaper, Blueprint Landscape Lifestyle Design LLC in Lawrence­ville; stonemason, Ted Serafin Contracting in New Brunswick; contractor to lift the home, Chesco Coring and Cutting Inc. in Malvern, Pennsylvania. Office/Den: wall color, Benjamin Moore Stonington Grey; copper fireplace vent, JBM Remodeling LLC in Columbus. Kitchen: wall color, Benjamin Moore Briarwood; cabinetry, cabinet hardware and walnut butcher block countertop, Christopher Peacock in Millburn; Calacatta marble countertop and backsplash tile, Atlas Marble & Granite in Springfield; pendants over island, James Street Home Décor in Port Stanley, Ontario, Canada; chandelier over table, Crystorama Lighting in Westbury, New York; table, One Kings Lane; chairs, Restoration Hardware; sconces, E.F. Chapman for Visual Comfort & Co. in Houston; Castile Beige limestone floor tile, Paris Ceramics in New York City; appliances, Sub-Zero and Wolf.